It’s a new week and we’re recovering from DC in D.C. which we’ll have lots of news out of coming in the next few days. While you wait, here’s some comic news and reviews from around the web in our morning roundup. The Comichron – Weak December puts 2017 comic shop orders down 10%; big drop, but from a lofty perch – The chances of another up year were slim. iO9 – Bruce Timm Wants To Make a Superman: Red Son Animated Adaptation – Yes please! IGN – The Walking Dead Gets Season 9 Renewal and New Showrunner – Not too surprising. Big-game hunter and private detective Paul Kirk has marshaled his skills to fight crime as the masked vigilante known as Manhunter. But now crime has reached epidemic proportions that may push him to the limits – and draw the attention of the Golden Age heroes Sandman and Sandy! Plus: a short story featuring Etrigan the Demon by writer Sam Humphries and artist Steve Rude. “Rocket Lanes of Tomorrow,” from REAL FACT COMICS #1 and “A World of Thinking Machines,” from REAL FACT COMICS #2, all featuring art by Jack Kirby. Prepare to take part in one of the greatest adventures from the infinite future of the DC Universe, and join the industry’s top creative teams in a round-robin, no-holds-barred, storytelling extravaganza titled THE KAMANDI CHALLENGE! Born from the mind of Jack “King” Kirby, the post apocalyptic Earth of Kamandi has been a fan favorite for decades, and now 14 intrepid teams of writers and artists build on this incredible foundation and take the title character on an epic quest to find his long-lost parents and travel to places seen and unseen in the DC Universe. There’s a scene in the Prologue where Batgirl is arguing with Batman over being taken off a case and she yells at him that she “got into this because of you.” (By the way, all of these quotes from the film should be taken as paraphrase from memory because I didn’t have the opportunity to take notes and there’s no script available) The context of her line is that Batman’s just told her that he doesn’t trust her because costumed crime-fighting is just a game for her, whereas Batgirl is pointing out that she became Batgirl because she was inspired by Batman and he’s been acting as her mentor. The two of them don’t have a sexual relationship at this point nor is Batgirl actively trying to start one, so I find this reading strange because it pushes the (arguably rather sexist) narrative that Batgirl is some sort of crazed groupie. It shouldn’t be a shock to anyone but Warner Bros. Home Entertainment has accepted an “R” rating from the MPAA for their upcoming animated film, Batman: The Killing Joke. I say it shouldn’t be a shock since the original source material graphic novel is what I’d consider an “R” rating as well. This is the first non-PG/PG-13 rated movie in the nine-year and 26-film history of the DC Universe Original Movie franchise. Batman: The Killing Joke, one of the best-selling graphic novels in history, tells the tale of The Joker’s origin story – from his humble beginnings as a struggling comic, to his fateful encounter with Batman that changes both of their lives forever. It also contains some of the most controversial material in comics history. The graphic novel won two Eisner Awards and was written by Alan Moore 28 years ago. It is consistently a top selling graphic novel, with this film being greenlit in 2013 and announced in July 2015. Actors Kevin Conroy and Mark Hamill reprise their Batman: The Animated Series roles as Batman and The Joker, respectively. Animation visionary Bruce Timm guided the DC Universe Original Movie franchise for its initial 16 films, then returned last summer with his own original story, Justice League: Gods & Monsters. Timm takes the reigns once again for Batman: The Killing Joke, reuniting a trio of actors (Kevin Conroy, Mark Hamill & Tara Strong) from the game-changing Batman: The Animated Series cast to add even greater reverence to this heralded tale. 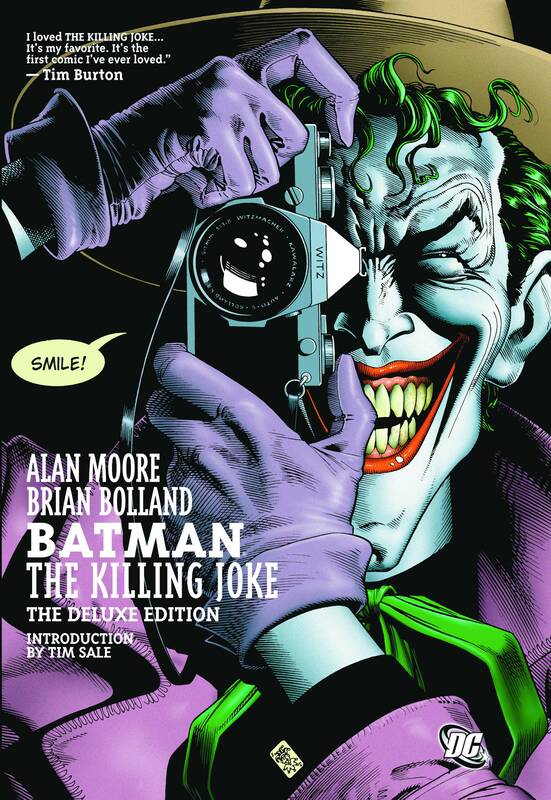 Recognizing the fans’ dedication to the highly acclaimed graphic novel, Timm has worked meticulously to accurately maintain the intense adult content of The Killing Joke. At this time, there are no plans for an edited, PG-13 version of the film according to Warner Bros. announcement. Batman: The Killing Joke also features the voices of Tara Strong, as Barbara Gordon and Ray Wise as Commissioner Gordon. The film’s World Premiere will take place at Comic-Con International this summer, and see a subsequent release in 2016 on Blu-ray Combo Pack, DVD and Digital HD. Tat relase date will be announced at a later time along with what other content we can expect. Spider-Gwen #1 Swings Back Into Action! Because you demanded it, the character that took the world by storm is back and she’s better than ever for a brand-new ongoing series this October! Marvel has released a first look at Spider-Gwen #1 – coming to you from the team of Jason Latour, Robbi Rodriguez and Rico Renzi! Now is your chance to jump in with a clean entry point into Marvel’s breakout sensation of the year! The answers you’ve been waiting for are here: the secret history of Gwen Stacy and Peter Parker revealed! Someone out there has recreated Peter’s Lizard formula. The same formula that mutated him, branded Gwen a fugitive and ultimately cost Peter his life. Gwen WILL NOT let that happen to anyone else – no matter the cost. But with NYPD Captain Frank Castle and the Kingpin of Crime Matt Murdock still on her trail, that won’t be so easy. Plus, the introduction of Norman Osborn and Harry Osborn. What could possibly go wrong? The next epic chapter of Gwen Stacy’s life is about to begin. You won’t want to miss the bombastic debut! Strap in and suit up, True Believer. The marquee comic launch of the fall is coming as Bendis and Marquez armor up to bring you a new Iron Man for a new Marvel Universe.